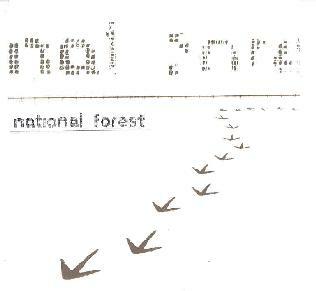 National Forest - "Soda Lake"
National Forest is a solo project created using what sounds like pretty simplistic keyboard gear, plus some guitar and violin. Of course rather than being a drawback the simplicity just challenges the artist to be more creative, and though this disc is barely 15 minutes long National Forest offers up some interesting, if not spectacular, tunes. "Soda Lake" is a quirky electronic dittie that combines several synth parts plus some voice samples. A bit on the oddball-pop side but I dig it. It's got a dancey beat, a bit of drum 'n bass, and some spacey strangeness. "Careless Love" is a one minute love song backed by an odd organ melody and fuzzed radio wave sounding electronics. "For November" is a dreamy electronic tune, and I think I hear a real violin on this track. And "1" is like a raw Tangerine Dream tune mixed with voice samples, one of which has an aggressive rap sound. It's a wild mixture that I'm sure will raise eyebrows and cause confusion though I give National Forest credit for being creatively strange and fun. For more information you can visit the National Forest web site at: http://www.national-forest.com/. Contact via snail mail Faith and Hope Records; 23 New Mount Street; Manchester; M4 4DE; UK.